An American child actress, Mckenna Grace is famous for portraying Faith Newman in "The Young and the Restless" and Jasmine Bernstein in the series "Crash & Bernstein." She has been active in the film industry since 2012 and will be appearing in the upcoming films, Amityville: The Awakening, How to Be a Latin Lover, and I, Tonya. Mckenna Grace was born on 25 June 2006 in Texas, United States. Her parents moved to Los Angeles after she earned her first recurring television role. Starting acting at such a young age as the only actor in her family, Mckenna said that her mother is the only person to give her best advice: "Well, my mom told me if you do your best, then you know that you did all you could have done, and you can do anything you put your mind to." Mckenna Grace started her acting career at the age of 7, where she starred as Jasmine Bernstein in an American live action TV comic series "Crash & Bernstein" in 2012. The series was created by Eric Friedman, which centered on a boy with three sisters who wishes to have a brother. Mary Birdsong (left) & McKenna Grace Talk "Crash & Bernstein." After making her debut in TV series, she began to appear Denis Hennelly's film "Goodbye World" where she played Hannah Palmer, which was written by Hennelly and Sarah Adina Smith. The film shows the life of a couple who parent their daughter while living off the grid until a tragedy brings about drastic shifts in the life they have been experiencing and the way they see their friends. Mckenna also had a recurring role as Faith Newman on television soap opera "The Young and the Restless" from 2013 to 2015. The series was created by William J. Bell and Lee Phillip Bell for CBS. At the same year, she played Young Emma, the child version of the lead character of ABC's "Once Upon a Time," in the premiere of the series' fifth season. In 2015, Mckenna held a recurring role on the CBS series "CSI: Cyber." Grace portrayed Daisy in the science fiction thriller film "Independence Day: Resurgence," which was directed by Roland Emmerich and released on June 24, 2016. In 2017, Mckenna played a lead role in the Marc Webb drama film "Gifted," starring alongside Chris Evans, Lindsay Duncan, Jenny Slate and Octavia Spencer. The film was directed by Marc Webb and written by Tom Flynn. Mckenna appeared as Arden alongside Salma Hayek, Eugenio Derbez, Rob Lowe, Kristen Bell, Raquel Welch, Raphael Alejandro, and Rob Riggle in How to Be a Latin Lover, an American comedy film directed by Ken Marino. Chris Spain writes the film along with Jon Zack and produced by Eugenio Derbez and Ben Odell. The film was released on April 28, 2017, by Pantelion Films. She also filmed the significant role of Juliet in the horror film "Amityville: The Awakening." The film is listed to be released worldwide on June 30, 2017, by Dimension Films, a division of The Weinstein Company. Daniel Farrands produced the film along with Casey La Scala and Jason Blum. It stars Bella Thorne, Cameron Monaghan, Jennifer Jason Leigh, Thomas Mann, Jennifer Morrison and Kurtwood Smith. Her upcoming sports drama film"I, Tonya" where she will be playing a role young Tonya Harding along with stars Bojana Novakovic, Sebastian Stan, Allison Janney, Paul Walter Hauser, Julianne Nicholson and Caitlin Carver. She has also performed in TV and films such as The Goodwin Games( 2013), Suburban Gothic( 2013), Clarence (2014), The Vampire Diaries(2015), Dog with a Blog(2015), Frankenstein( 2015) Teachers( 2016), The Lion Guard(2016), Designated Survivor(2016), and Bizaardvark( 2016) . Mckenna is a fourth-grade student, and her favorite subjects are History, Science, and Math. She is a huge animal lover. Mckenna has a Morkie 'Marshmallow" and a Pomeranian "Baby Unicorn." She enjoys being outside, especially if it’s raining, singing, playing board games, hanging out with her family and friends and apparently watching movies. Her favorite movies are E.T. and everything by director Tim Burton. 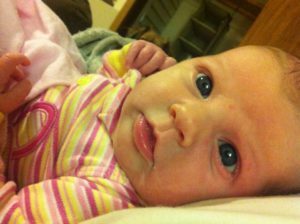 Mckenna, often defined as an old soul, is very caring from the tiniest of bugs to her family and friends. Her sweet spirit, a genuine heart for others and love for life make her a joy to be around. Mckenna loves Harry Potter!. She is not allowed to watch the movies until Mckenna finishes the book. She said that Mckenna fancies books over the movies and when she finishes the series, she wants to go to Harry Potter World. Mckenna Wants to visit Paris and the Eiffel Tower. Grace, the only vegetarian in the family started following has been a vegetarian since she was seven years old because of her love for animals. Mckenna has a huge collection of vintage toys, including over 50 E.T. collectibles. She became a Girl Scout during a ceremony on March 24, 2017, in Los Angeles. 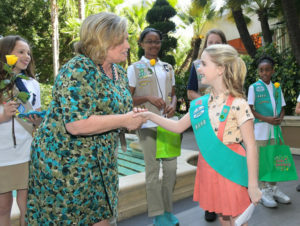 “Being a Girl Scout means standing up to bullying and volunteering in your community,” Mckenna explained while receiving her pin. “Being a Girl Scout means striving to be the best version of yourself. Seeing the patches on all of your vests and knowing you put your heart into earning them is inspiring to me.” She also assured to make the earth a better place and be a sister to every Girl Scout. Mckenna is one the successful child actress and has already earned a handsome amount from her career. She surely makes an attractive salary from her career and most of the income hails from her performing arts, which adds up her current net worth of $ 300 thousand. Mckenna holds an American nationality and belongs to white ethnicity. Being a talented teen actress, she is also active on social networking sites.